Hueneme (pronounced “why-NEE-mee”) is derived from a Chumash Indian word meaning “half-way” or “resting place,” and it is believed that the Chumash stopped at Point Hueneme as they transited between today’s Point Mugu and the mouth of the Santa Clara River. Point Hueneme is at the southern entrance of the Santa Barbara channel, where the direction of the coast changes considerably, and where for more than 10 miles the land is very low—in fact, not much above the level of the sea. The position of the point, therefore, would be good, but for the disadvantages of low ground, drifting sands, and the neighborhood of a number of lagoons, which make it difficult to build and not desirable to live there. Anacapa island, the eastern end of which is but 12 miles to the southward and westward of Hueneme, is believed to be at that point about 250 feet above the sea, and a light there would not only command the Santa Barbara channel, but the waters to the south, southeast, and southwest of it, with an arc of visibility of nearly 300 °. Anacapa is rocky and destitute both of wood and water. Its sides, which are bluff, and the want of a harbor, will make building difficult and expensive there. These disadvantages, however, are not greater than those which exist at Point Hueneme, while in respect to situation that point is decidedly inferior. It is therefore recommended that instead of a fourth-order light at Point Hueneme, as contemplated, a first or second-order light be established at Anacapa, estimates for which purpose are accordingly submitted. Anacapa island belongs to the general government, while the title to Point Hueneme must be acquired. It is proper to add that the owners of the point have offered to give to the United States a piece of land suitable for a light-house. For some reason, the Lighthouse Board changed its mind and decided to place a fourth-order light on Point Hueneme. Congress allocated $22,000 on March 3, 1873 for this lighthouse, and remote Anacapa Island would have to wait until 1912 to receive its light. 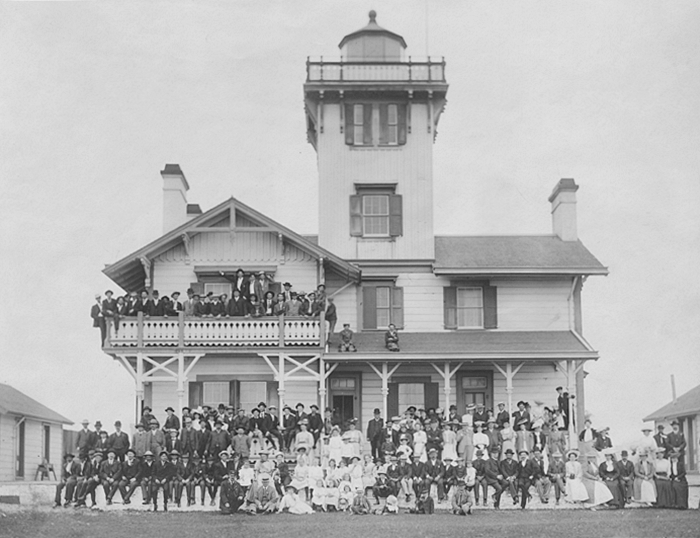 The firm of Salisbury and Co. was awarded the contract for Point Hueneme Lighthouse, and work began on April 25, 1874. Built in what has been described as a craftsman style with Swiss and Elizabethan influence, the original lighthouse consisted of a two-story residence, with a square tower extending an additional story above the dwelling’s pitched roof. The spacious residence had ten rooms, served by four fireplaces, with the head keeper and his family occupying the first floor, and the second story belonging to the assistant keeper, when one was assigned to the station. The first entry in the station’s log book reads “November 9, 1874. 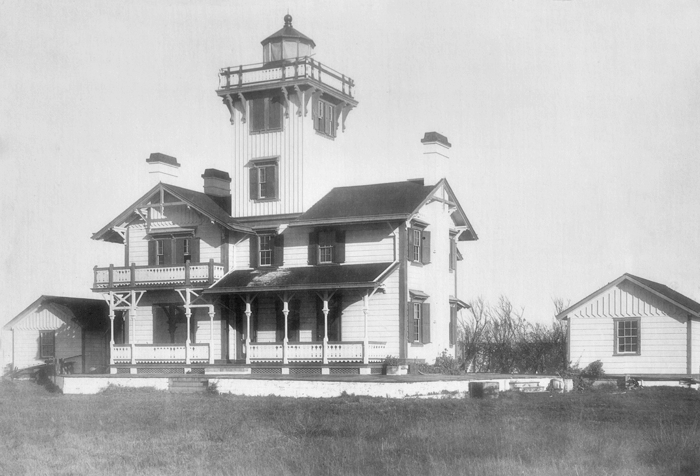 I, Samuel Ensign, having been promoted from 1st Assistant Keeper at the light at Pigeon Point, San Mateo County, California, and appointed principal keeper of this station have this day taken charge of Point Hueneme Light Station.” Melvin P. Giles, the assistant keeper, arrived shortly thereafter from San Francisco with his family, having taken passage on the steamer Constantine. With the help of a lampist, the keepers prepared the lighthouse for its inaugural lighting on December 15, 1874, which interestingly was the same day a nearly identical lighthouse commenced operation at Point Fermin, south of Los Angeles. In regards to Point Hueneme, the 1882 Annual Report of the Lighthouse Board noted: “It is important that a steam fog signal should be established here. The numerous passenger and other steamers, in going up and down the coast, pass inside Anacapa Island, and very near the coast, which here makes a considerable elbow. The land at this point is quite low, and is so for ten miles inland, so that it is difficult to see if there is any fog.” The sum of $7,000 was requested for the steam fog signal, but the funds were never provided. The signature of the light changed over the years. For its first fourteen years of operation, a steady white light, interrupted every minute by a flash, shone from the tower. On April 1, 1889, the light became fixed red, and three years after that, it was changed to occulting white, with intervals of five seconds between the eclipses. In 1899, the tower received a new revolving fourth-order Fresnel lens, which produced a white flash every five seconds. To do his part, Keeper Rosendale donated forty-six pounds of Angora goat wool to the Red Cross along with the prized billy goat itself, which was raffled and sold for twenty-five dollars. A natural canyon with a depth of thirty feet lies just off Point Hueneme, and in 1872, a 1,500-foot wharf was constructed at the point so goods could be lightered from the coast to ships anchored offshore. The agricultural output of Ventura County increased in the early 1900s, and two giant Sunkist lemon-packing plants were constructed in 1922. Richard Bard, son of a U.S. Senator, spearheaded an effort to bring a deep-sea commercial port to Point Hueneme to broaden the market for the county’s products. Bonds for the amount of $1,750,000 were issued to fund the project, and in less than fifteen minutes after the sale opened on May 5th 1938, the bond issue was fully subscribed. On January 24, 1939, Standard Dredging Company began work on the harbor. Richard Bard, who would become known as the ‘Father of Port Hueneme’ was tasked with turning the first shovel of dirt at the ‘official’ groundbreaking ceremonies, which weren’t held until February 4th. 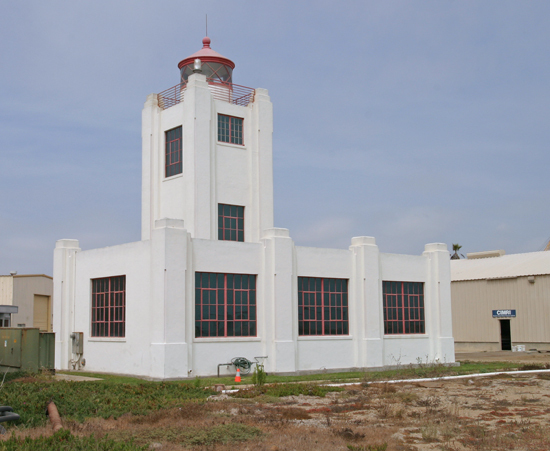 As the entrance to the harbor would be dangerously close to Point Hueneme Lighthouse, a new combination fog signal/lighthouse was planned for the east side of the harbor’s entrance. 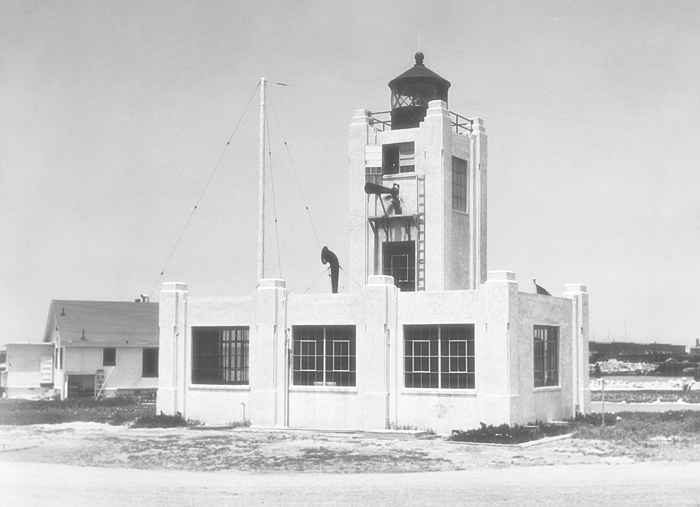 A temporary light was established nearby on November 1, 1939, and the lantern room, lens, and clockworks mechanism were removed from the old lighthouse and stored until the new structure was finished. 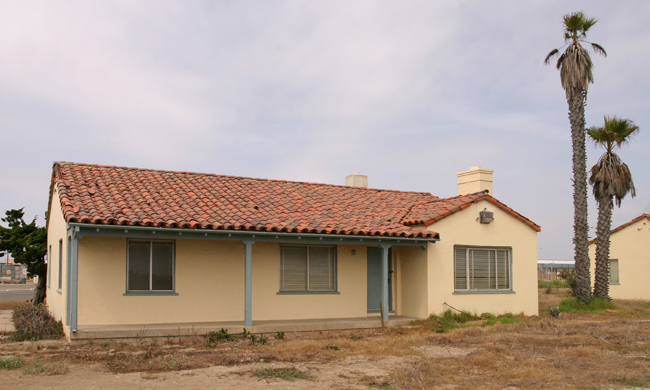 The historic Point Hueneme Lighthouse was sold at auction in October 1939 for use as the Hueneme Yacht Club, with the stipulation that the new owner had to relocate the structure as soon as possible. The lighthouse was barged across the harbor’s entrance, a move which attracted much local attention and took place between February 15th and 18th of 1940. During the move, cables used to draw the lighthouse to the barge snapped, and the lighthouse settled back the six feet it had been drawn. Seven men were beneath the lighthouse at the time and narrowly escaped being crushed. Keeper Walter White, who had raised his family in the old lighthouse, hated to see the structure be taken away. At the time of the move, White spoke at a program sponsored by the Chamber of Commerce of Oxnard, recounting the history of the station since its establishment in 1874 and showing the original logbook with its pages curled by time. After years of neglect, the old lighthouse was eventually torn down. Work on Port Hueneme, which was now the only deep water port between Los Angeles and San Francisco, was officially completed by July 4, 1940, and a two-day dedication was held over the weekend of July 6th & 7th 1940. 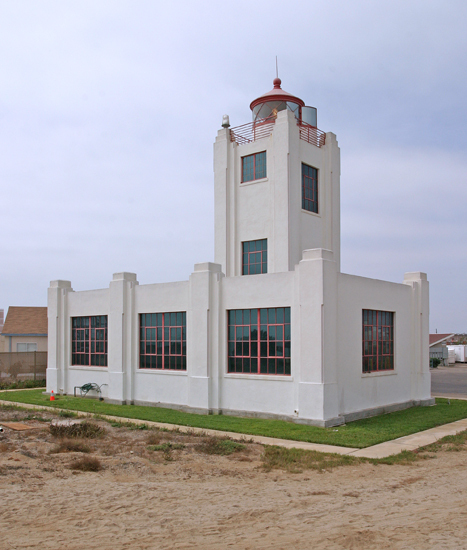 Built in an art moderne style, the new lighthouse, now interchangeably called Point Hueneme or Port Hueneme Lighthouse, was completed in December 1940 and consists of a forty-eight-foot-tall, square, concrete tower rising from a one-story fog signal building. Previously, two dwellings had been finished near the site of the new lighthouse to house the keepers and their families. On December 7th, 1941, plans for Port Hueneme were abruptly changed, as control of the port was transferred to the Navy. The port would handle more dry cargo during World War II than any other U.S. port. When peace finally returned to the Pacific, the port was returned to civilian operations. In 1996, the port led the nation in citrus exports. As for imports, large cargo ships off-load a nearly-constant stream of foreign automobiles. The 1899 fourth-order Fresnel lens used in the original tower continued its countless revolutions atop the new concrete lighthouse until the Ventura County Cultural Heritage Board voted 5-0 to retire the lens from active service. 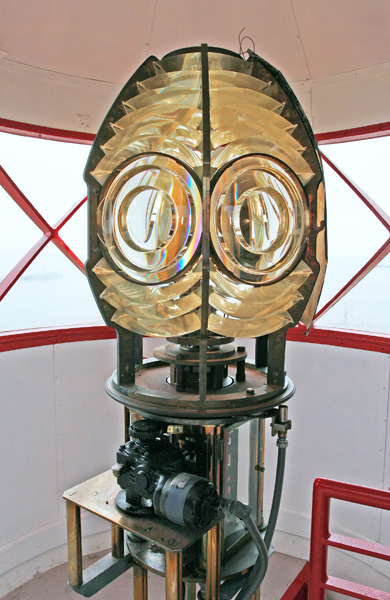 In making their decision in November 2012, the board, which is contracted by the City of Port Hueneme to serve as a review panel for historical decisions, cited a guideline in the National Historic Lighthouse Preservation Act that states, “active use of the Fresnel lenses is not conducive to long-term preservation.” After being cleaned, the lens was placed on display on a lower floor of the lighthouse, where it is easier for the public to view. Head: Samuel Ensign (1874 – 1878), John A. F. McFarland (1878 – 1882), E. H. Pinney (1882), Jesse K. Glasby (1882 – 1894), Charles F. Allen (1894 – 1911), Anna H. Allen (1911), Charles F. Allen (1911 – 1914), Henry Rosendale (1914 – 1927), Walter White (1927 – 1948), Leo Y. Kellogg (1948 – 1952), George S. Ward (1952 – 1957). Assistant: Melvin P. Giles (1874 – 1875), Benjamin Korts (1875 – 1878), W.F. Webb (1878 – 1880), John Ross (1880 – 1882), Jesse K. Glasby (1882), Herbert C. Trotter (1911 – 1914), Henry Linne (1914 – ), Albert F. Flagel (at least 1915 – at least 1917), Glenn R. Merrell (1919 – at least 1920), Ernest C. Tate (at least 1921), Carleton Douglas ( – 1923), Frederick C. Zimmermann (1923 – 1927 ), Ernest L. Kemp (at least 1926), John O. Becker (at least 1929 – at least 1930), George C. Lee (1930 – 1931), John H. Elliott (1931 – 1932), Percy L. Oppel (1933 – 1935), John O. Lunden (1935 – 1937), James E. Thomas (1937 – 1938), George S. Ward (1938 – 1952). “Point Hueneme Lighthouse,” Thomas M. Ward, The Keeper's Log, Fall 1992. “Stormy Harbors, A Retrospect of Ventura County’s Three Harbors and Their Problems Over the Years,” Dave Crowell, Reporter, August 1998. “Century-old Port Hueneme Lighthouse lens is set to be retired,” Arlene Martinez, vcstar.com, November 26, 2012. 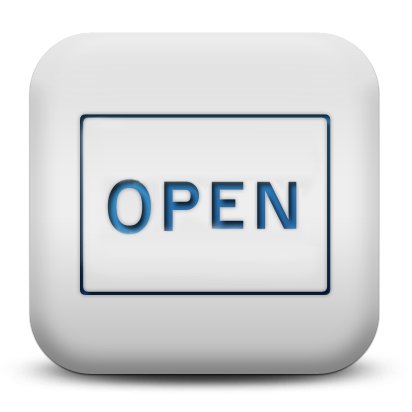 Located on the south side of the entrance to Port Hueneme at 120 W. Port Hueneme Road. 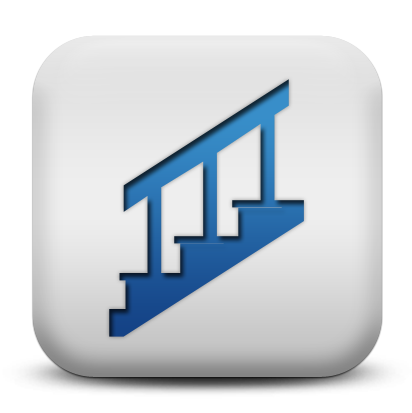 For a larger map of Point Hueneme Lighthouse, click the lighthouse in the above map. From Highway 101 north of Los Angeles, take Highway 1 south towards Oxnard and Port Hueneme. 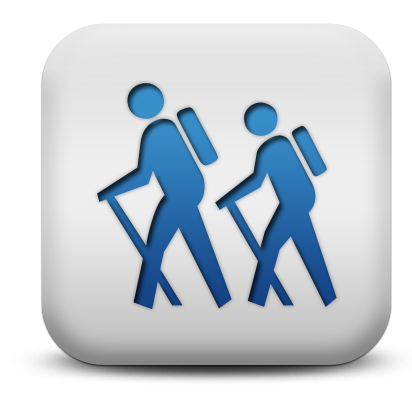 After roughly 3 miles, exit onto Saviers Road (Highway 34) and drive south for 2.9 miles to its end. Turn right onto Hueneme Road, go one mile and then turn left onto Ventura Road. When Ventura Road ends after 0.3 miles, turn right onto Surfside Drive. Park along the street near the Flag Plaza and follow the Lighthouse Promenade north on foot about 1/2 mile, where you can view the lighthouse behind a fence. 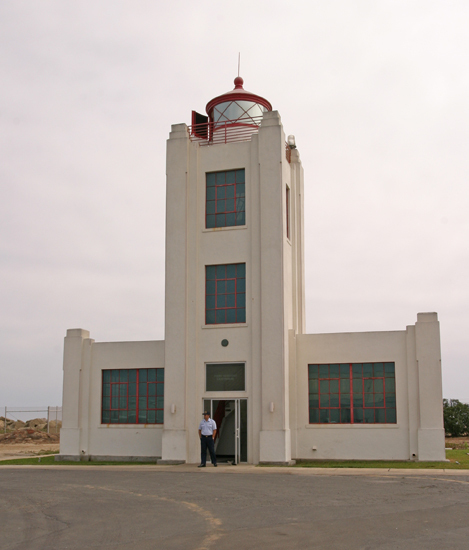 Since July 2002, the Coast Guard has hosted a free open house at Point Hueneme Lighthouse on the third Saturday of every month from 10 a.m. to 3 p.m. During this time, visitors can walk 0.5 miles to the lighthouse using the Lighthouse Promenade and gain access to the lighthouse. The lighthouse is owned by the Coast Guard. Grounds/tower open during tours.